This Scottish guy was given Ketamine in hospital to soothe his pain as doctors broke his ankle in order to reset it in the right place. Ket is famously very wavy, and its intended application is as horse tranquilizer, so it’s not that surprising that this Glaswegian was enjoying the ride. 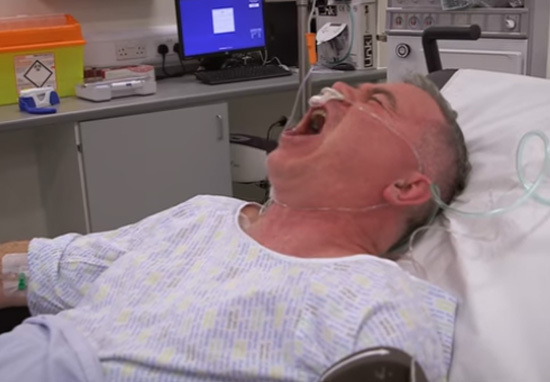 The hilarious scene, filmed for the BBC’s Scotland’s Superhospital, shows Neil Buchanan screaming ‘I’m the man!’. Neil fractured his leg in three places after taking up skateboarding again after 35 years, and so needed to endure the painful surgery to get it reset. What would have been a traumatic experience turned into the trip of his life as he shouted and moaned about how great he was feeling while the doctors did the necessary. Excuse me, I’m just going to accidentally break my leg.